Canning is a method of preserving food in which the food contents are processed and sealed in an airtight container. Canning provides a typical shelf life ranging from one to five years, although under specific circumstances a freeze-dried canned product, such as canned, dried lentils, can last as long as 30 years in an edible state. Now I doubt that I will ever can anything that will last 30 years, but I would like to keep things up to a year, and safely, so I decided to do a bit of research. 1. Why does canning make foods last longer? 2. What is the difference between a pressure canner and processing jars in boiling water, apart from the obvious? Botulinum spores are very hard to destroy at boiling-water temperatures; the higher the canner temperature, the more easily they are destroyed. Therefore, all low-acid foods should be sterilized at temperatures of 240° to 250°F, attainable with pressure canners operated at 10 to 15 PSIG. PSIG means pounds per square inch of pressure as measured by gauge. The more familiar "PSI" designation is used hereafter in this publication (the Complete Guide to Home Canning). At temperatures of 240° to 250°F, the time needed to destroy bacteria in low-acid canned food ranges from 20 to 100 minutes. 3. I don't have a pressure canner - what do I need to do to process using boiling water? I don't have a pressure canner either, though I am considering getting one. 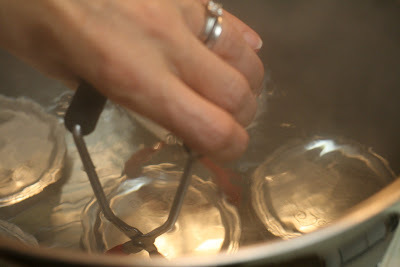 However, boiling water canners are great for many types of canning, and generally faster and easier to use. These canners are made of aluminum or porcelain-covered steel. They have removable perforated racks and fitted lids. The canner must be deep enough so that at least 1 inch of briskly boiling water will be over the tops of jars during processing. Some boiling-water canners do not have flat bottoms. A flat bottom must be used on an electric range. Either a flat or ridged bottom can be used on a gas burner. To ensure uniform processing of all jars with an electric range, the canner should be no more than 4 inches wider in diameter than the element on which it is heated. Interesting stuff! Do keep it coming!